The Panasonic VW-BC20 Charger is a compact and portable wall charger supporting Panasonic VBN130 and VBN260 batteries. 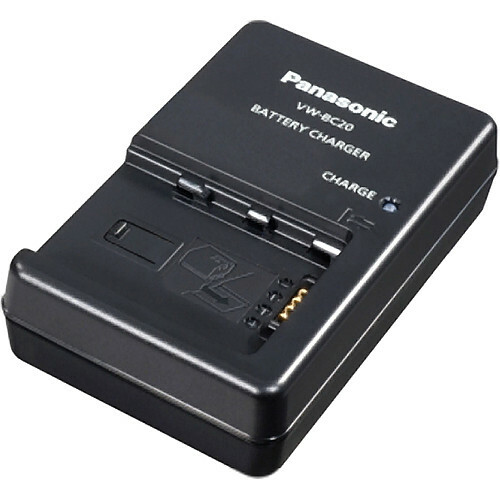 These batteries are found among the following Panasonic camcorders: HDC-HS900, HCX800, HCX900, HCX900M, HC-X920K, TM900, SD900, and SD800. Box Dimensions (LxWxH) 8.8 x 4.7 x 2.5"
VW-BC20 Charger for VW-VBN130 & VW-VBN260 Batteries is rated 4.4 out of 5 by 35. Rated 5 out of 5 by Keith from Must have Battery Charger I have a Panasonic HDC-TM900 High Definition Camcorder. Normally the battery can only be charged through the camera. The charger allowes me to charge a spare battery while the camera is in use or charge two batterys at once. It takes approx 2 hours to charge the VW-VBN130 and approx 4 hours to charge the VW-VBN260. This is a bit slow but it enhances life span of the expensive lithium-ion batteries. Rated 3 out of 5 by Harold M. from Just an OK charger Hurrah! Now I can charge my spare batteries while I am using my camera. The supplied charger that comes with the HDC-SD800 will only allow you to charge the battery while it is mounted on the camera, rendering the camera useless while the battery is charging. Pretty dumb Panasonic. This accessory charger does the job and is worth the cost as you are free to use your camera while a spare is charging in the background. The negative is a very slow charge time. For the standard battery that gives one hour of use when recording 1080p, it takes about 2 hours to recharge the battery. A quick charge battery would be nice. Also, why is a long 120v power cord needed. Suggest this is eliminated by including integrated outlet prongs on the back of the charger. Overall, not impressed with Panasonic's understanding of customer needs with their new line of camcorders that has eliminated the stand alone charger. Rated 5 out of 5 by Walter Casha from Best online service ever Having purchased a new Panasonic video camera we searched everywhere (online and in camera shops) for this external battery charger. Just not available WORLDWIDE. Put a note on B&H's website to notify us if it became available with little hope that it would before we left for an 8.5 month holiday to South America. To our delight, within 2 weeks they notified us it was available for purchase and it arrived 5 calendar days later!!! unbelievable. We think B&H are the greatest, you've made our holiday better. Rated 4 out of 5 by Rick from Great Charger I have three batteries and I don't like charging them on the camera. The charger works well and as expected. The only thing that I didn't care for was the price. The unit should have been in the box with the camera when purchased. Rated 4 out of 5 by Costa Rica videoboater chick from Good quality and good price This product arrived quickly, didn't have too much packaging (yay! ), and works well! There are no flimsy cords or cables, just one thick power cord that attaches to the main charger. Both fit easily into my pelican case with my video camera. It has a built in change of charge so that you don't need to worry about voltages if you travel, which I do. Especially after my regular cord quit on me, this was an essential item, and I am definitely satisfied! Rated 5 out of 5 by Nick shooting on the road from Original Equipment!!! When I got the camera - and battery - from a disreputable company, and the battery charger they supplied failed... I turned to reputable B&H to fix the situation, and fix it right! Now, I have a great camera, great battery, and great original manufacturer equipment! battery charger! Thank You B&H! I feel so much better now - and once again B&H saved the day - with the right product!, that works! I will not stray from B&H again!